Slight risk today, though some uncertainties due to early day convection. Enhanced risk tomorrow for central/W Texas and SW Oklahoma, certainly worth following this as the 500mb flow increases and the surface conditions looking favourable to come together for tornadoes. BE NEEDED EARLY THIS AFTERNOON. ADJACENT WESTERN/SOUTHERN OK CENTERED ALONG THE RED RIVER VICINITY. I'm becoming very concerned about the Red River Valley. The convection thus far has well to the N and W and SPS. You have these bands of convection that try to get going oriented NW-SE that haven't fully initiated as of yet. The environment continues to destabilize in this region. The FWD 1800 UTC sounding has a large area of CAPE prior to its termination just above 500 mb. SPC mesoanalysis only indicates about 100-200 m^2/s^2 of eff. SRH, but forecasts that to increase as the afternoon progresses, to around 200-300 m^2/s^2. T/Td spreads at the sfc are very manageable, ranging from 7-11Â°F, and the FWD sounding shows quality moisture through the depth of the boundary layer. I would anticipate development in the next few hours to the southeast of the current convection, and I think the environment will likely be extremely favorable for tornadoes by that time. In short, I fear we may be facing a localized tornado outbreak along the Red River Valley this afternoon and evening. ^ Taken from a local storm chaser on the American weather forum I use, just an hour ago. Looks like things MAY be heading towards more severe ingredients than originally thought earlier in the day today. FWIW Red River Valley seperates the S border of Oklahoma and N Texas, around the DFW area...I BELIEVE. The cell south of quanah is very intense precipitation, wouldnt like to be in that now it is tornado warned. david drummond cell east of crosbyton has just gone tornado warned too - clearer view of system. 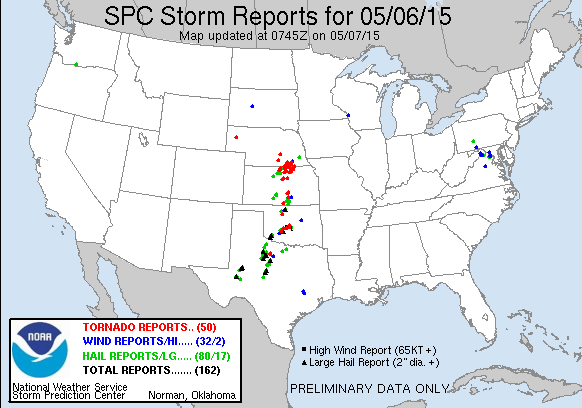 From last night's reports we have 3T's, with the largest hail reported at 4.5". Last night a let down... and I'm afraid after what it looked like earlier in the week, today is heading that way too! Annoyingly, the MCS that have been around each day this week haven't allowed sufficient atmopsheric recovery for potential to be fully reached. So if you're vitual chasing where would you chase today? Friday to Sunday looks very active again! I think that you may get a rinse and repeat of the last week. Initially from say midweek it looks like any activity will be confined to Texas, but the next major focus should be next weekend where at this point it looks like another shortwave trough will be ejected from the Pacific coast into the plains and a similar pattern to the last fews days will emerge. Looking highly probable of a MODERATE risk will be issued in the next SPC update for southern Oklahoma and Noth Texas and the enhanced area to be extended.